To save typing, from here on out I’ll refer to Grinsted et al. as G and Rahmstorf as R. The remainder of this entry refers to the model package (in my library), which you can run with the Vensim Model Reader or advanced versions of Vensim. 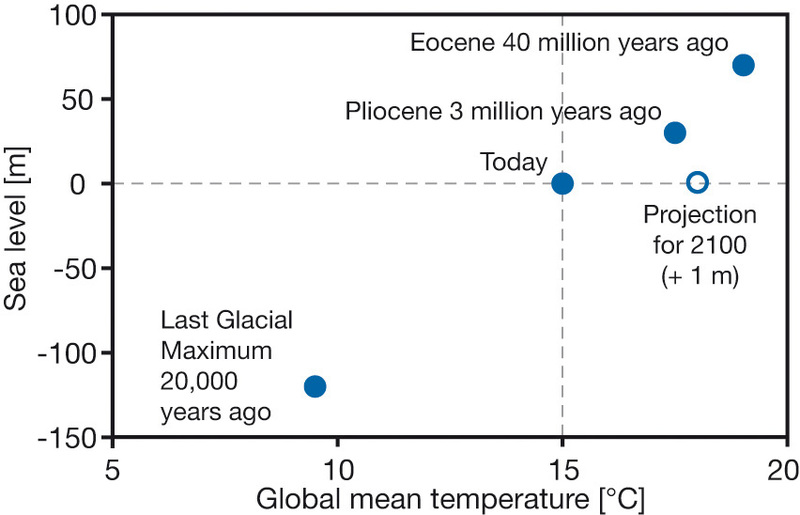 In his earlier paper, R starts with the same conceptual structure, but assumes in addition that the time constant of sea level rise, tau, is long, and therefore that over short time scales the rate of sea level rise (starting from a preindustrial equilibrium) is a linear function of temperature, with a slope proportional to a/tau in the generalized model. (See Business Dynamics, section 8.3.1, for a further explanation of the response of exponential decay processes to perturbations). In formulating the model, I performed a change of variables in (1), expressing it instead as a*(T-T0), where b = -a*T0 and T0 represents the temperature at which equilibrium sea level is zero. This has no effect on the mathematics, but makes hand calibration and optimization easier (for reasons that will be clear further on). 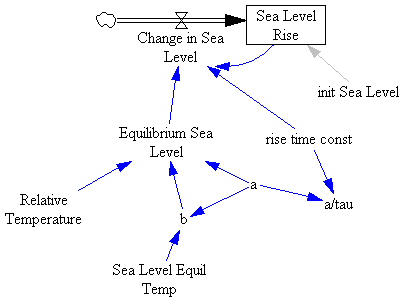 Note that in Grinsted, sea level is a 1st order negative feedback loop, which seeks an equilibrium governed by temperature and the choice of a and b. Rahmstorf’s simplified model is open loop; i.e. sea level is a pure integration of the rate of sea level rise. 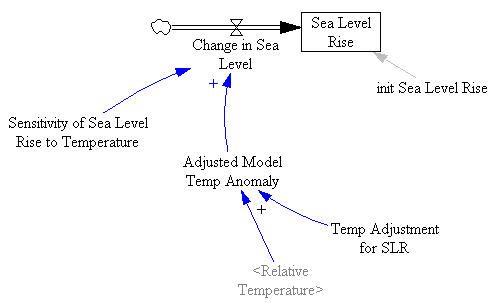 It is in equilibrium only when temperature is at the zero-point for sea level rise (Temp Adjustment for SLR on the diagram). 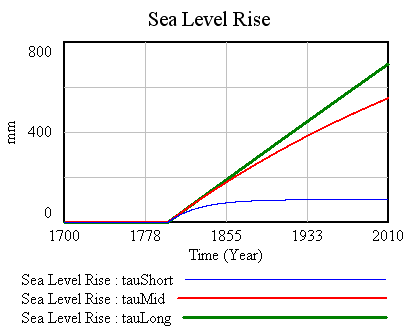 The tauLong run is a good approximation of R’s assumption; the rate of sea level rise hardly changes over 200 years. The tauMid run (somewhat comparable to G’s experiments) is still a decent approximation of long tau over time horizons for which we have data. The tauShort run, on the other hand, implies a drastically different response. Note that all have the same initial slope (just after 1800), and thus that any run with a long time constant that conforms to data (roughly, to a given historic slope, given by a/tau) is likely to yield similar projections for the future with this structure. One way to convince yourself of this is to set a to 0, then try to find a parameterization for T0, tau, and initial sea level that yields a trajectory something like the data. Next, we need temperature data (to drive sea level change) and sea level data (to compare with the simulated results). Fortunately that’s easy to download (I’ve included data and URLs in a spreadsheet with the model package). In this model, data is pulled from a spreadsheet using Vensim’s GET XLS DATA function; I find this convenient, but there are other options (importing from files or ODBC, for example). The one option that wouldn’t work us putting the data in lookups; if we intend to use automated calibration, we need data variable, to preserve information about missing values and improve computational efficiency. 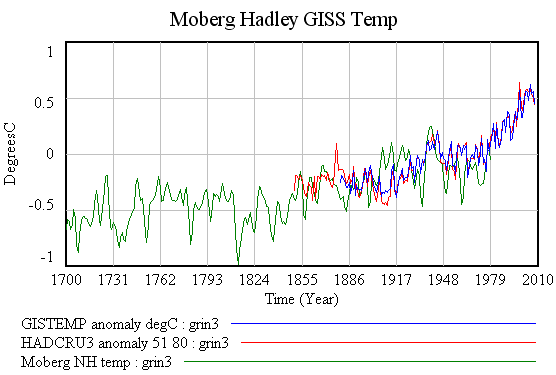 Notice that the GISS and Hadley versions of the instrumental record are in fairly close agreement (after normalizing them both to zero mean over the same reference period, 1951-1980). The Moberg reconstruction differs somewhat (in part because it’s a Northern Hemisphere record, rather than global) and presumably has larger errors (I haven’t bothered to check, but obviously would if this were a paper rather than a blog entry). 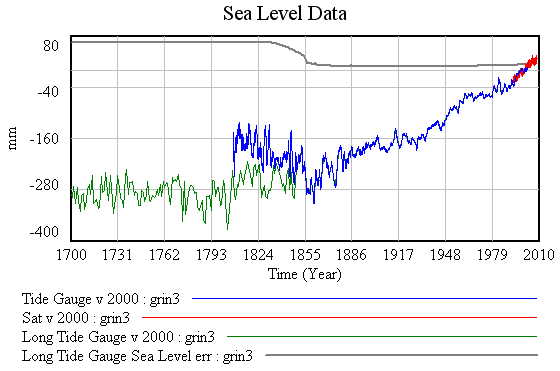 There are a few puzzles on the sea level data. First, the paper references a tide gauge sea level reconstruction from Jevrejeva et al. 2006, but the data I found from that paper starts in 1807 (in blue above). A 2008 Jevrejeva et al. reconstruction does start in 1700, so I’ve used that (green). The two disagree somewhat in the first half of the 1800s. Notice that during the period of disagreement, reported standard errors (in gray) are large. However, the magnitude of the discrepancy between series is larger than the reported standard error. Either the papers are measuring slightly different things, or there’s a significant systematic component that leads to underestimation of the error bounds. Next installment: replicating Rahmstorf’s results. Update: I inadvertently uploaded a non-working model, so I’ve replaced the link with one to a working version (in my library). Does anyone ever allow for displacement in the ocean when calculating sea levels? I am not involved with sea level monitoring, or any climate work, but I don’t think i’m daft, and it appears obvious that as we (man) put more things in the ocean, basic displacement will cause a rise in sea levels. The oceans cover 3.6million square kilometers. Every tonne suspended in the ocean will displace its own weight to stay afloat, so by doing the math we can work out that every billion tonnes floating around will rise the oceans worldwide by 2.7mm. This may not seem a lot, but when you look at how many million tonnes of rubbish are dumped every year, how many trawler ships, navy fleets, tankers, private yachts, and other large things are floated in the ocean. this is before you look at the likes of floating airports in japan, developments in floating cities etc. Melting icebergs, by the same math, will not rise the ocean, unless they are held by land and not floating. Floating ice melting will not change the sea levels because they displace the same weight of water as they contain. Interesting question, but I don’t know the answer. My guess is that the largest mass flow, by far, is from accelerated soil erosion due to ag & forestry practices. I don’t know whether anyone’s accounted for that. I do know that fairly recent model corrections were made for water impounded behind dams, which turns out to be significant. Also, while it’s true that there’s no net buoyant effect of floating ice, there is a gravitational effect that changes the distribution of sea level rise, http://www.sciencedaily.com/releases/2009/02/090205142132.htm .